Following on the heels of the June opening of the Cabana Bay Beach Resort, Loews Hotels & Resorts and Universal Orlando Resort have announced a new venture: the 1,000-room Loews Sapphire Falls Resort at Universal Orlando, which is scheduled to open in summer 2016. It will represent the fifth hotel that has been created in partnership between the two companies. The other properties include the Loews Portofino Bay Hotel at Universal Orlando, Loews Hard Rock Hotel at Universal Orlando, Cabana Bay Beach Resort at Universal Orlando and Loews Royal Pacific Resort at Universal Orlando. The new build property will be set between Cabana Bay Beach Resort and the 1,000-room Royal Pacific. A covered bridge will connect Sapphire Falls with the Royal Pacific. “That will really allow us to market it as a 2,000 room property with 272,000 square feet of meeting space,” Whetsell said, adding that, when Sapphire Falls comes online, Loews will have one of the largest meetings facilities in Orlando. “That gives us the confidence that, regardless of how the overall market is performing in Orlando, we will have the ability to bring in self-contained groups into this facility,” he said. Like the Royal Pacific, Sapphire Falls will target the four to four-and-a-half star customer, Whetsell said. 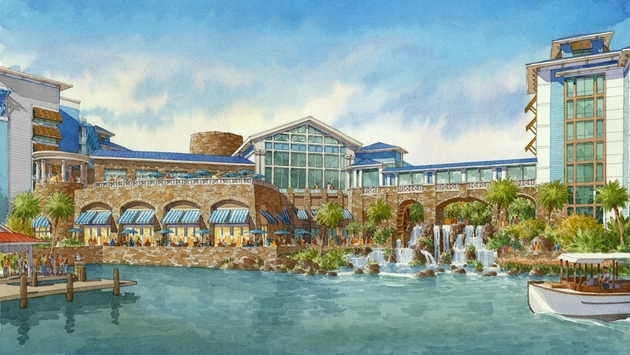 While Royal Pacific features six food and beverage outlets, Sapphire Falls will probably be constructed with three. “It will be a little more streamlined,” he said. For its part, the 1,800-room Cabana Bay, which opened in June, is positioned as a three-and-a-half star property. “Cabana Bay was our first foray into the three-and-a-half star market,” Whetsell said, adding that the property, which has no meeting space, targets the transient market. Out of the five Loews property, Portofino is the most upscale, while the Hard Rock caters to a younger, hipper clientele, Whetsell said.